The U.S. stock market crashes in 1929, marking the beginning of the Great Depression. This worldwide economic depression lasted through the 1930’s. 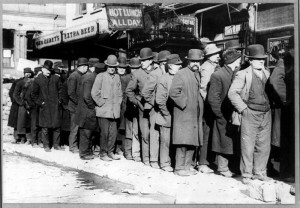 At the peak of the Great Depression in 1933, some 13 to 15 million Americans were unemployed and nearly half of the country’s banks had failed. Countries indebted to the United States, especially Germany and Great Britain were also hit hard by the economic slump. The jobs created with the start of the World War II effectively ended the Depression.